Our sole purpose is to produce, once a year on Easter weekend, the story of the Passion of Christ. 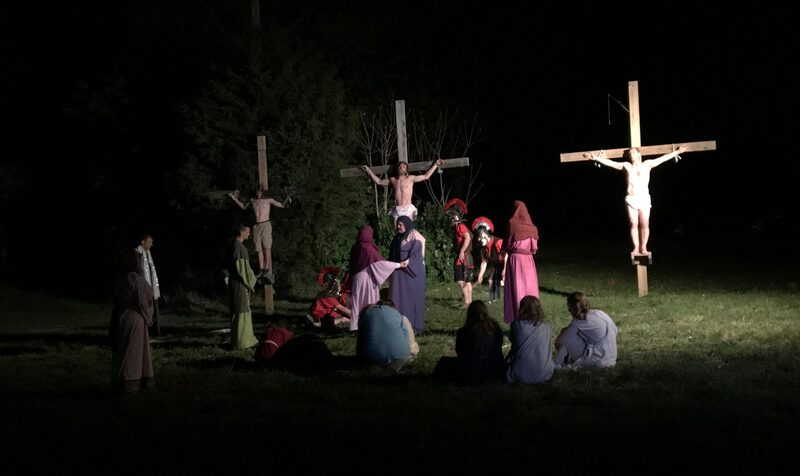 The production is performed outside on Good Friday and Saturday evenings with live animals. If rains, we have an indoor venue available. Our production is a little different from most as we must build our theater every year. Of course, we need stage managers, stage crew, lighting crew, sound, makeup, costumes, and set painters and builders like every other show. An armorer would be really helpful to work with soldiers outfits. The production is open to anyone to participate in - we have had Methodists, Baptists, Lutherans, Catholics, Presbyterians, Non-denominational church members, as well as atheists and other non-Christian members of the community. This is an all volunteer cast and crew. On His way to die for our sins. Jesus took upon himself the sins of us all. We are not capable of making an acceptable sacrifice for our own sins. Therefore, God took it upon himself in the form of his son, Jesus, to pay the price for our sins for us. Jesus chose 12 disciples and had many other followers besides. At the Last Supper, He gave his followers new instructions and tried to prepare them for his coming death. We hold auditions every year and need about 70 performers of all sorts - actors, musicians, singers, dancers. We are in need of a choreographer. All positions are volunteer. Rehearsals run for approximately 5 weeks, starting with indoor spaces and then moving to out outdoor stage two weeks prior to the show. Churches that support the Passion of Christ with rehearsal space.